Champagne Pools are one of the most unique natural attractions on Fraser Island. 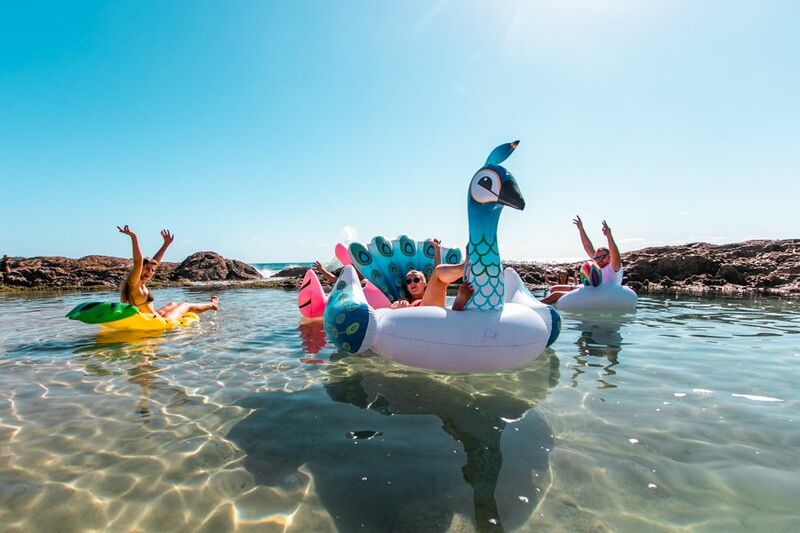 The naturally formed rock pools create a collection of shallow, sandy swimming holes right on the edge of the ocean with a stellar view of its surroundings. With each wave, the pools are renewed with water, creating a jacuzzi-like feeling as the foam fizzes around you for a feeling that is unique to this sought-after destination. While the Champagne waters cause delight with each wave, visitors should keep an eye out large waves! They sweep into the pool periodically, and can sometimes catch people unawares, even bringing fish in with them. During low tide, the pools are much calmer and create the perfect place to soak in the salt water and enjoy the sound of the ocean. 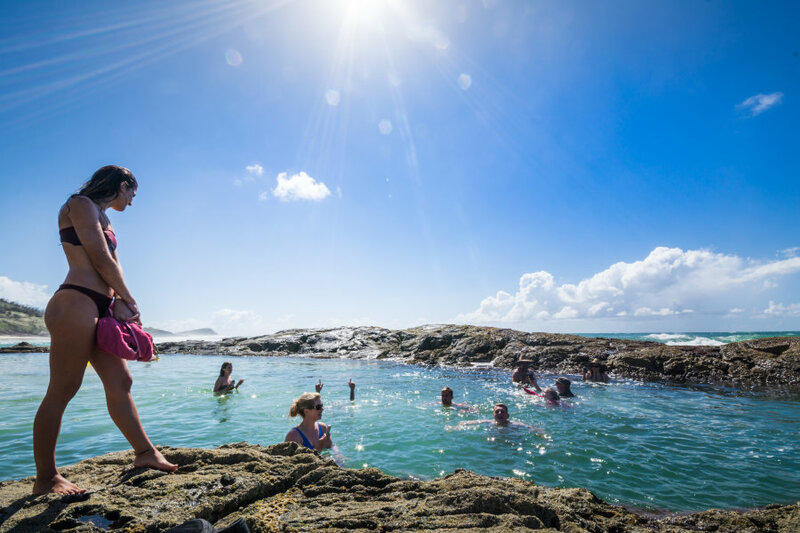 It is cautioned to be careful while enjoying the Champagne Pools as while the surrounding rocks provide protection from the larger ocean, they also can leave visitors with a nasty scratch or two if they lose their footing or get caught by a wave. Visitors are not allowed to swim anywhere except in the pools themselves as the current and tides are very strong in the open water and even the strongest swimmers will struggle against them. 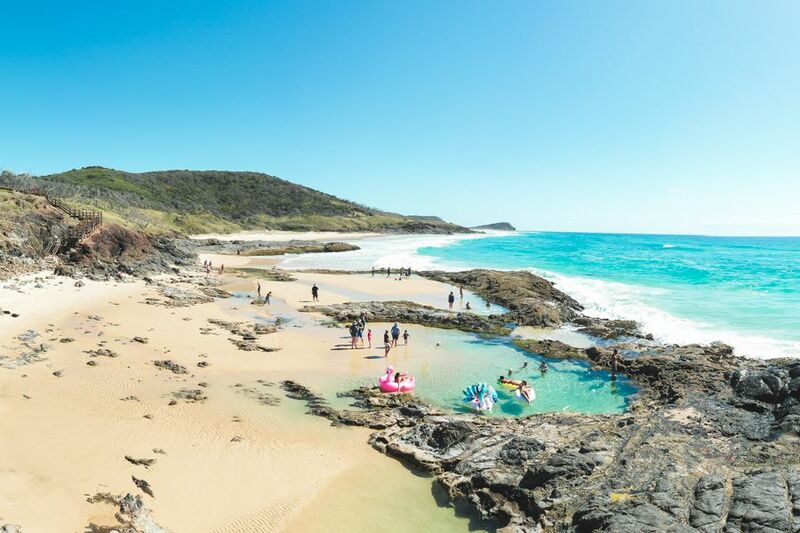 The Champagne Pools are the best way to experience swimming in ocean water while on Fraser Island as swimming in the surrounding water is not allowed due to strong currents, marine stingers and a healthy shark population. The Champagne Pools are located along 75 Mile Beach on the eastern side of the island, between Waddy Point and Indian Head. To get to the pools, visitors must drive about 2.2km north along the beach from Indian Head. From here, visitors must walk a short boardwalk and several stairs to get down to the pools. 4WDs can park on the beach below or use the parking lot that is located inland and make their way to the pools from there using the marked pathways. Due to the remote location of the Champagne Pools and time restrictions some tours may not visit this sight, if this stop is important to you please let your travel consultant know.